BioArt is a modern art-form born from the marriage of biotechnology and human inspiration. I argue that the longevity of the art pieces, referred to as BioArtworks, plays an essential role in communicating meaning. As living, breathing creatures, humans are designed to best interpret messages that develop in real-time. BioArt is uniquely optimized for this fluid process. I discuss the temporal strength of living media by examining BioArt construction, maintenance, termination, and reincarnation, while also incorporating audience-level impacts throughout. In doing so, I interweave themes and techniques—including tissue culture, microsurgical grafting, and genetic modification—from several popular BioArtworks to form a network of lifespan-related factors. Then, the physical framework is connected to ontological and bioethical philosophy to analyze how viewers perceive BioArtwork. The biotech industry continuously develops tools that electrify the imaginations of budding bioartists and further diversify their expressive palettes. The medium materials evolve both pre- and post-production. Thus, an organic, time-cognizant approach is needed for optimal analysis of this modern art form. Humans have an innate desire to take inspiration from modernity and recreate the objects around them. 18th century Romanticist artist J. M. W. Turner rabidly scoured the market bins for newly developed pigments, favoring impulsive experimentalism over well-proven classicalism to create his inebriating watercolors. Likewise, bioartists are in constant pursuit of newly developed biotechnology, synthesizing fantastical biological entities into reality. However, Turner’s reckless abandon for the nouveau riche resulted in pigment colors that quickly faded, perfectly embodied by the 1930’s Daily News article Turner’s Masterpieces: Can His Works be Saved? (‘Turner’s Masterpieces: Can His Works Be Saved,’ 1930, p. 4). However, there exists a fundamental difference between Turner’s deflowering paintings and the bioartist’s rapidly biodegrading masterpieces. When warned of his materials’ capriciousness, Turner sought justification in the present: Achieving maximum stimulation in the here and now justifies a diminished afterglow. The bioartist, in contrast, is forever enchanted by the future—the present is merely a passing love affair. For example, notice the word saved in the Turner-centric Daily News title. To be saved, the watercolors must be considered damaged. However, BioArt ages like fine wine, becoming not damaged, but instead, refined. It spoils beautifully. The process of death is intrinsic to biology: Uncontrollable overgrowth, microbial attack, and fungal infestation carry their own important messages about what it means to be alive. A Genomic Portrait: Sir John Sulston. 2001. BioArt focuses on the visceral, the bloody, the concept of living existence. In the mind of Eduardo Kac, a field forefather, BioArtworks stem from “an instinctive drive to return to materials that have physical, sensory characteristics” (Vita-More, 2007, p. 174). Indeed, what medium could be more sensory, more carnal, more in tune with human perception, than the structures that underlie our own glands, muscles, and nerves? Still, simply locking a garden rabbit in a cage would not constitute art. A common zoo is not a museum. Art involves change. This change, this alteration to reality’s status quo, provokes paradigm shifts in audience viewpoints. In the words of Vita-More, a renowned American artist, art involves “the reconfiguration and reinvention of the subject” (Lapworth, 2015, p. 86). Traditional works centered on biological muses can achieve such reinvention with a simple shift in media—a lethargic bovine is transfigured into Expressionist Franz Marc’s World Cow (1913), albeit with fine artistic flair. In traditional art’s grand alchemy, flesh and bone is transmuted into wet canvas. However, bioartists must get more inventive: The living, breathing, excreting muse is the artistic medium. Thus, bioartists must alter life itself to express their ideas. More concretely, BioArt “utilizes laboratory practice and biotechnology to explore living systems” (Yetisen, Davis, Coskun, Church, & Yun, 2015, p. 724). As a medium, life is fluid, multi-faceted, and most uniquely, mortal. It dies. I argue that this property of limited longevity, whether due to natural or artificial reasons, allots BioArt a new dimension for communicating messages: Time. Before delving into the lifetime of a BioArt piece, I discuss three factors that directly impact discussion of lively longevity: BioArt’s common definition, the tools of the trade, and associated locations. Following this background knowledge, I elucidate three main stages within an artwork’s post-birth existence: Maintenance, termination, and reincarnation. Throughout, I incorporate examples of prominent BioArt, juxtaposing exhibition environments with the associated bioethical and ontological messages imparted on audience members. 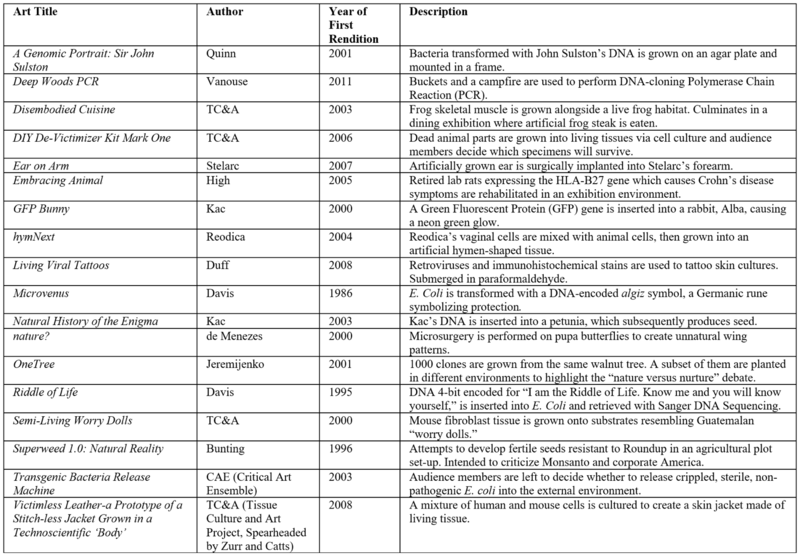 For reference, see Table 1 for a summary of every discussed BioArtwork. Defining life is complex. Defining art is complex. Defining their offspring is near-impossible. Prominent figures like “Melentie Pandilovski, director of Experimental Art Foundation” believe “BioArt cannot be image-based, text-based, dead biomaterial, or solely software actions that resemble biological action” (Vita-More, 2007, p. 175). This is short and sweet, but also, highly restrictive. Suzanne Anker, Fine Arts Chair at the New York City School of Visual Arts, takes justifiable affront. She argues that BioArt includes “imagery garnered through methods such as MRI atomic force microscopy, electrophoresis, gene sequencing” and “the incorporation of 3D computer modelling software, artificial life, robots, biodegradable scaffolding” in addition to BioArt’s bread and butter: “Wet laboratory practices such as tissue engineering, the cloning of animal and plant cells, transgenic microorganisms, and ecological investigations” (Anker, 2014, p. 1). In short, Anker posits BioArt can include pieces about life, provided some form of biotechnology is utilized. Professional definitions and boundaries conflict. Some bioartists embrace this ambiguity. Catts, co-founder of BioArt incubator TC&A (Tissue Culture and Art Project at the SymbioticA Research Centre), “finds the act of defining bio art ‘problematic,’” but enjoys how the ensuing argumentation fosters meaningful discussions about what is considered lively (Byerley & Chong, 2015, p. 206). I adopt the viewpoint that it is “counterproductive to corner BioArt” with strict definitions such as Pandilovski’s, which limit creativity through hard-line exclusion (Vita-More, 2007, p. 175). Still, I recognize that providing meaningful analysis of longevity requires a definition-grounded backdrop. Thus, in this paper, BioArt is considered an “umbrella term” where “an artist utilizes emerging biotechnologies from the scientific and medical fields in the creation of an artwork” (Byerley & Chong, 2015, p. 206). However, most of my analysis will focus on works involving live (e.g. transgenic organisms), semi-living (e.g. tissue culture), or actively decaying (e.g. decomposing flesh) matter due to their prominence in the BioArt ecosystem. The techniques and materials of BioArt play an important role in a living piece’s long-lastingness. Overall, ingredients include “scientific paraphernalia, biological processes, body fluids, serums…dead or live animals, plants, microorganisms…sensors, computer chips, and naked bodies” (Anker, 2014, p. 1). To deconstruct this massive palette, University College London artist Frances Stracey provides four sub-categories: DNA portraits, life sculpting, transgenic collages, and semi-living entities. DNA portraits include those like Quinn’s A Genomic Portrait: Sir John Sulston (2001) where DNA contributed from John Sulston’s sperm was inserted into transparent bacteria and “cultured on a plate of agar jelly” (Kemp, 2001, p. 778). For the final piece, the A4-sized growth plate was mounted to communicate how genomic information transcends simple self-portrait in capturing self-identity. In contrast, de Menezes sculpts life with nature? (2000) by performing microsurgery with red-hot cauterizing needles and “micrografting” tools on the “pupa stage of a butterfly” to create unnatural wing patterns (Zurr & Catts, 2004, p. 8). Natural structures are manipulated and tweaked. Is this type of early-stage beautification the next step for plastic surgery? Is this ethical? After all, the unwillingly modified butterflies do live content, normal lives. This work comments on cultural pursuits of idealized beauty. The most famous transgenic collage is Eduardo Kac’s GFP Bunny (2000) where Kac, with the help of two scientists, inserted Green Fluorescent Protein (GFP) genes into a rabbit, Alba, causing her to glow “bright green” (Stracey, 2009, p. 499). Whole organisms are upgraded with new cores. In direct opposition, semi-living artworks focus on building creatures from the ground up. Unlike transgenic collages, these BioArtworks require external resources beyond food, water, and shelter. Victimless Leather-a Prototype of a Stitch-less Jacket Grown in a Technoscientific “Body” (2008), hence referred to as Victimless Jacket, cultured a mix of “3T3 fibroblast (mouse) and HaCat keratinocyte (human) cell lines” in a bioreactor to create a skin jacket made of living tissue (Stracey, 2009, p. 498). Though it fails the 8 Characteristics of Life test found in introductory biology textbooks, many would hesitate to deem this moist, slowly moving masterpiece as dead. Other works stray even farther from the concept of liveliness. Davis’s Riddle of Life (1995) involved synthesizing a “174” base-paired DNA molecule with the words “‘I am the Riddle of Life. Know me and you will know yourself’” using a 4-bit (bases A, T, C, & G) coding scheme, transforming E. Coli with it, and retrieving the message via Sanger DNA sequencing (Yetisen et al., 2015, p. 728). Is DNA living? How about when artificially inserted into a host? The audience must decide for themselves. Using traditional scientific research labs, specially designed BioArt creation facilities (such as TC&A’s SymbioticA Centre in Perth), and bio-outfitted DIY (do-it-yourself) garages, bioartists incite discussion over the modification of life. Some use the help of scientists. For GFP Bunny, Kac reportedly worked with “Louis-Marie Houdebine and Patrick Prunet at the… Institut National de la Recherché Agronomique-National Institute of Agronomic Research (INRA)” (Davis, Boyd, O’Reilly, & Wieczorek, 2001, p. 2). Others, such as Vanouse’s Deep Woods PCR (2011)—a project which used buckets and a campfire to perform DNA-cloning Polymerase Chain Reaction (PCR)—are inspired by the legend of the lone-ranger scientist. Creations spaces are as various as their products. Moreover, no tools are off-limit: Presently, artists experiment with cutting-edge CRISPR-Cas9 (precision gene-editing sgRNA-protein complex) and IPS (induced pluripotent stem cell-cloning) technologies. Eventually, BioArt pioneer Davis predicts that “artists will find themselves creating functional genomes, organisms made from whole cloth or from scratch” (Davis et al., 2001, p. 7). However, whatever the form, all living entities—even semi-living or potentially-living ones—age and end. Mortality involves nourishment, expiration, and potentially, rebirth. I focus on these stages for my main discussion on longevity. 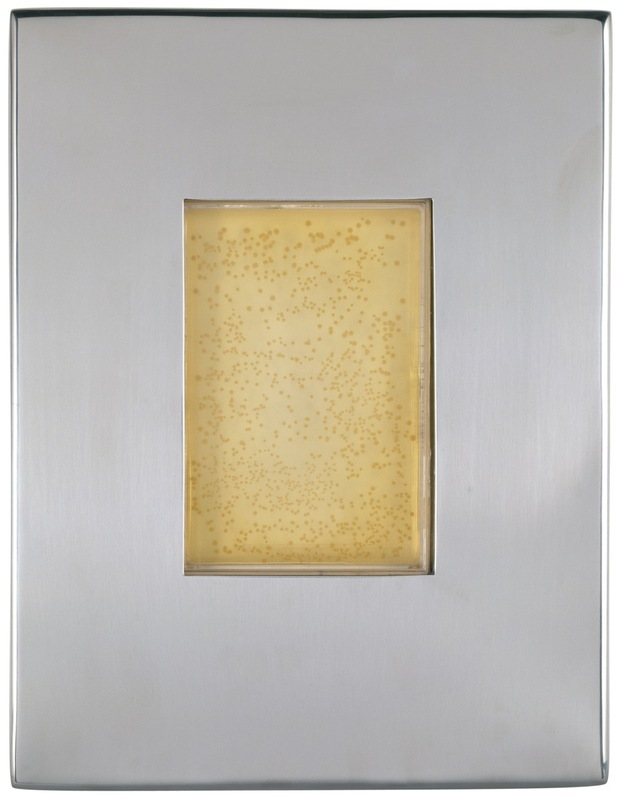 Most BioArt pieces are created in a laboratory-type environment with laboratory-type equipment. Predictably, the traditional art museum is not the optimal location for exhibiting these wet-works. However, this incompatibility is “not an unknown challenge for the contemporary art gallery” (Kallergi, 2008, p. 3). Curators are at the beckoning of popular demand. If museums have historically implemented specialized shading systems for light-sensitive antiques and audio-visual equipment for digital art, then why not create a miniaturized biotech lab space for BioArt? This is precisely what happens: “The tissue culture lab, in short, must be brought into the spaces where the art is installed…transgressing boundaries” and allowing public eyes past the barred gates of the hermetical research facility (Birke, 2009, p. 118). Contemporary art centers like Austria’s “Ars Electronica [are] willing to establish a fully functioning laboratory in an exhibition setting” (Byerley & Chong, 2015, p. 211). This enables them to display works like Semi-Living Worry Dolls (2000) where “mouse fibroblast tissue was grown onto substrates resembling Guatemalan ‘worry dolls’” (Yetisen et al., 2015, p. 731). These cell cultures, coddled in toasty incubators and cured in antibiotic syrup, required an exhibition with “rotating bioreactors,” creating a microgravity environment to encourage three-dimensional tissue formation (Willet, 2006, p. 5). Similarly, the semi-living Victimless Jacket incorporated a three-dimensional bio-absorbable scaffolding and constant doping with fetal bovine serum supplied via “peristaltic pump” (Cogdell, 2011, p. 27). It also required a stable temperature and humidity range (Radomska, 2016, p. 164). Further complexifying matters, the Victimless Jacket frequently succumbed to illness. In Tokyo, “the sculpture became infected with fungi” resulting in a ten-day antifungal treatment (Radomska, 2016, p. 163). Still, while semi-living pieces may involve the most maintenance machinery, transgenic organisms essentially entail adopting a museum pet. High’s Embracing Animal (2005) showcased “three retired breeding rats” that expressed “HLA-B27, a human class I major histocompatibility complex molecule” causing Crohn’s disease symptoms (Stracey, 2009, p. 499). Properly servicing rats requires food, bedding, heat, and play-toys. Even less lively works like A Genomic Portrait: Sir John Sulston needed a refrigerated stainless steel case to stabilize bacterial colonies (Stracey, 2009, p. 497). On a whole, museum docents, managers, and conservationists are dealt a heavy plate. However, unlike with most traditional art, the process of maintenance is essential for many BioArtwork messages. Bio-based entities require resources, or in other words, food. Zurr and Catts, leaders of BioArt incubator TC&A, regard feeding “within the gallery as an integral part of the artistic experience,” believing that the “Feeding Ritual” raises “questions about the caring and nurturing needed for all life forms” (Zurr & Catts, 2004, p. 12). This theme has been present since the beginning of BioArt, when Alexander Fleming, father of Penicillin, preserved colorful microbial paintings in sterile agar containers that served as long-lasting food banks for his microscopic friends. Providing care establishes emotional connection. Moreover, as Lippard and Chandler describe in 1968, “the experience of these living works is temporal so their specific meanings fluctuate depending on when a spectator experiences the work” (Byerley & Chong, 2015, p. 211). For example, the Crohn’s disease rats in Embracing Animal, initially hoary and cantankerous, gradually regrew fur and started to playfully interact with each other (Stracey, 2009, p. 498). An early observer of the work might view it as commentary on the necessary, but often cruel, nature of biomedical research. In contrast, after the rats recover, audience members may perceive the rodents to symbolize biological resilience even in the face of insurmountable challenge. However, even if a BioArtwork does not physically masticate its food like a rodent, the maintenance is still a show. In the case of the Victimless Jacket, the hazy spherical container, connected to a “drip system with its exposed glass containers and pipes filled with pink-colored nutrient solution” and bathed in blood-tinged backlighting, evokes “cultural imaginaries of how science is supposed to look” (Radomska, 2016, p. 164). When the dripping guts of experimental apparatus are laid bare, science fiction steps down to reality. Like in dystopian literature, the future often goes wrong in Bio-Art. The “feeding, breathing, metabolizing, and multiplying/growing that are specific in each case [of art] are not always consistent with those imagined by the artist” (Radomska, 2016, p. 166). In the case of Victimless Jacket, the foreign fungi invasion in the Tokyo exhibition proved unstoppable, forming a “flower-shaped excrescence” on one of the sleeves (Radomska, 2016, p. 163). This caused the hosting museum to restart from the cellular base materials, creating a new skin-suit acceptable for formal presentation. On one hand, this clean-slate redo is necessary for a well-touted exhibition piece. Museum visitors want to see the advertised exhibition, not a mangled mass of fungal cells. On the other hand, these types of artistic reboots also detract from semi-living BioArtworks’ interlayered meanings. The lives of semi-living creatures have “no scripted outcomes”: This aspect of instability provides a counterweight to the “false sense of complete control over living materials (which seems to be the ideology governing the biotech industry)” (Willet, 2006, p. 5). Despite extensive planning, lab work seldom produces perfect results, even if the procedure is followed exactly. In another rendition of Victimless Jacket at the New York Museum of Modern Art (the NYC MoMA), biological containment was successful. However, misfortune is inevitable. The redesigned glassy fortress was nigh impregnable to outside attack yet exceedingly susceptible to an internal coup d'état. The Victimless Jacket is constantly nourished to promote unfettered growth, but the glass incubator has finite space. The feeding hand is bitten and unsustainably excreted. The cells “grew over the scaffold and then continued beyond until the arm was falling off and the incubator was clogged” (Cogdell, 2011, p. 27). Living in a land of limited resources, whether it be Earth or a bulbous incubator, undeniably situates death as destiny. Life is “always already in the state of becoming-waste,” always aging and always degrading (Radomska, 2016, p. 183). By the hand of Nature or the hand of Mankind, living organisms die. This death, however, often gives birth to new wonder in BioArt. The metaphorical phoenix rises. With Davis’s Riddle of Life (2000)—wherein E. Coli were transformed with a message-encoded, synthetic DNA strand—all “bacteria featured in the exhibition were autoclaved when the exhibition closed” (Yetisen et al., 2015, p. 729). Due to red-tape that limited “international transfer of recombinant organisms,” the exhibition was “recreated” at different global laboratories (Yetisen et al., 2015, p. 729). The treatment was clean, safe, ethical, bioregulation-abiding, efficiency incarnate. However, in the world of provocative BioArtistry, it was, in a word, lackluster. Millions are executed and nobody hears the screams. In a similar case, “for both technical and legal reasons…each time the artists [Zurr and Catts] present their semi-living sculptures, they have to grow the objects anew in a local laboratory” (Radomska, 2016, p. 163). Unlike Davis, though, Zurr and Catts incorporate some pizazz. Their VictimlessJacket has been recreated at least ten times, but each version ends in a Big Bang. Meaning is fabricated in a post-mortem void. At the NYC MoMA, curator Antonelli deemed the Victimless Jacket’s clogged incubator as a sign the piece was “worthy of death” (Cogdell, 2011, p. 27). A public execution followed. The MoMA Jacket was ceremoniously cut off from its nutrient supply and left to fester (Radomska, 2016, p. 184). Unlike the sanitized sterilization performed by Davis, who has “been criticized by some for facilitating the ‘aestheticization’ of biotechnology and playing down perceived risks,” the Victimless Jacket’s full-flavored decay inspires “‘critical reflection’ and ‘discussion’” surrounding unnatural life (Yetisen et al., 2015, p. 720). Of course, a subsequent incineration ensured compliance with safety standards, but as true in human society, the most important, change-inducing moment is the Victimless Jacket’s actual death. In this instance, the funeral extends beyond routine mundanity, reaching beyond the physical and invoking themes of divine judgement. Zurr and Catts, founders of TC&A and masterminds of Victimless Jacket, wield Death’s philosophy-beveled scythe masterfully: After all, in addition to creating the feeding ritual, the pair also formalizes the killing ritual. Killing is generally a highly active, hands-on activity. Blood splatters. However, in the case of BioArt, while the actual execution often involves lovingly orchestrated violence, it is also a symbolically kind process. With their Semi-Living Worry Dolls, Zurr and Catts “engaged the audience explicitly in the liveness” of the dolls by “exposing them to the non-sterile conditions of the world outside of Petri dishes and incubators, allowing audience members to touch them with (gloved) hands” (Vaage, 2016, p. 89). In this way, the killing ritual “forces the artists and the viewers” into an active role in the “cycle of the life/death” (Zurr & Catts, 2004, p. 10). With semi-living pieces, it means “transforming back the semi-living to a ‘sticky mess of lifeless bits of meat’” (Zurr & Catts, 2004, p. 12). With transgenic organisms, it means “euthanasia of a living being that has no one to care for it” (Zurr & Catts, 2004, p. 12). Rest in peace. Zurr and Catts remark that due to killing’s associated moral responsibility, “an indifferent relationship to the Other (that [which] is located somewhere in the continuum between the living and the non-living) is almost impossible” (Zurr & Catts, 2004, p. 10). They were right: When MoMA curator Antonelli switched off the Victimless Jacket’s pump, she remarked, “I felt cruel when I turned it off” (Steiner, 2010, p. 173). This comment resonates with Catts’s belief that audience members and museum workers often did not truly “believe our [Zurr and Catts’s] sculptures were alive until they were killed” (Zurr & Catts, 2004, p. 12). Terminating an independent creature elicits unease, a response further amplified with the euthanasia of a self-functional transgenic animal. These dyspeptic emotions are intentional: Bioartists aim to “work with technologies they are uneasy with, and seek to spread that unease” (Vaage, 2016, p. 98). Dissonance fosters new viewpoints. After all, displaying queasiness about authority-sanctioned killing is surprisingly out-of-habit for modern society. Most humans view events from the viewpoint of humans. With widely prevalent “Judeo-Christian attitudes towards the animal kingdom…[we] care for the environment to the extent that it will provide (such as food, clean air, economic benefits, feelings of wellbeing etc.) for humans” (Zurr & Catts, 2004, p. 6). In short, there is a strong sense of anthropocentrism present in society—admittedly, though, this self-importance is vital for evolutionary survival. We protect the trees: They provide oxygen. We coddle our cats, dogs, hamsters, and rabbits, even transgenic ones: The cute and cuddly soothe us. Eduardo Kac wished to adopt Alba, the fluffy GFP Bunny, as a pet due to a “commitment to respect, nurture, and love” (Bryant, 2009, p. 126). In other words, a remarkable rabbit deserves remarkable pampering. E. Coli are not cute and cuddly. Hand sanitizers enact mass microbial genocide. Bacterial artworks are indifferently autoclaved and incinerated. Research rats, seldom considered cute and cuddly, are killed by the handful. Monkeys, slightly more cute and cuddly, are still modified, disemboweled, and dissected behind lab doors. For the most part, humans don’t bat an eye. Don’t ask, don’t tell. Don’t know, don’t care. Don’t see, don’t grieve. The Victimless Jacket breaks habit. It’s not cute and cuddly, and yet, audience members were saddened at its death. Why? The Victimless Jacket is a tissue made of artificially-grown human and mouse stem cells. As TC&A points out, “You might be killing more [human] cells when you brush your teeth in the morning” (Vaage, 2016, p. 80). With our anthropocentric minds, the mixed-in mice cells are even more meaningless. However, MoMA curator Antonelli, along with other audience members, felt cruel killing the Victimless Jacket. Philosophers Thomas Mooney and Samantha Minnet believe that “art is not sufficiently serious a cause for doing any kind of harm” (Vaage, 2016, p. 98). However, I disagree: Carefully orchestrating deaths creates powerful emotional pulls in BioArt. TC&A’s (and the majority of bioartists’) works carry a sense of “escaping anthropocentrism” by breaking habits (Vaage, 2016, p. 97). All life, even if highly unusual, has value. Deliberate extermination of any entity—monkeys, rats, E. Coli, animated skin jackets—necessitates careful deliberation. This moral message only appears upon examining the “durational art practice rather than [only] perceiving the ‘result’ in the end” (Zurr & Catts, 2004, p. 10). BioArt temporally invokes audience empathy through the discordance of death. The hive mind shatters. At the same time, the laboratory gates open. Private research procedures are publicly displayed. Thus, BioArt provides a novel canvas for the masses to express conflicting emotions about lab and industry operations through real-time experiences. Two pieces, the DIY De-Victimizer Kit Mark One (2006) and Disembodied Cuisine (2003), oozing with dark humor, playfully invoke this same cognitive dissonance about another cult of widely accepted “massacrers”: Carnivores. In the DIY De-Victimizer KitMark One, a “vacuum cleaner” for the “feelings of guilt when consuming meat (dead animal bodies),” dead body parts were “re-life-ed,” nourished, and grown via tissue culture (Radomska, 2016, p. 107). Viewers oversaw the tissues’ care, then made decisions about which animal’s spawn should be killed due to exhibition-imposed resource limitations (Radomska, 2016, p. 107). Initially, audience members would feel guilty about slaughtering their coddled tissue “pets,” but after repeated rounds of euthanasia, a self-noticeable desensitization developed; this situation mirrors society’s ingrained indifference towards domesticated cattle. However, before the culling process becomes routinized, audience members truly do care for their tissue companions and are guilty executioners. This art exhibit was only successful because the components lived and died: Arbitrating biological death after establishing a co-existive, organism-to-organism relationship—actions uniquely possible with time-spanning BioArt—commands great emotional levity. Disembodied Cuisine takes things further. At the L’Art Biotech show in France, “frog skeletal muscle was grown over biopolymer…while healthy frogs lived alongside” (Carruth, 2013, p. 95). On the final show date, the artificially grown frog “was cooked and eaten in a Nouvelle Cuisine style dinner,” while the whole and living frogs “were released to a beautiful pond in the local botanical garden” (Carruth, 2013, p. 95). The striking contrast in pre-destined fate, where some donors of biologically-identical tissue are granted freedom and others are fed to devils, incites dissonance. When audience members eat the artificial steak, gently marinated in garlic honey, in a “pastoral scene of chirping frogs in a verdant garden” on a dining table “hermetically sealed in a plastic bubble,” there is relief (Carruth, 2013, p. 96). Saving the live frogs overrides the odious stigma of eating artificial tissue. And yet, why are cell-cultured steaks not the norm? Simply put, palatability checks and balances ethicality. Serving stem-cell frog tissues in refined French establishments would be swiftly dismissed, yet the idea of live-frog dissection is more sentimentally repulsive than slicing up manmade tissue loafs. Cultural norms conflict with moral standards. This culinary experiment, through its hands-on antics, was a rousing success. As English scholar Robert Mitchell states “about TC&A’s Disembodied Cuisine…even simply learning that such a project is ‘out there somewhere’ can produce a sort of adrenalized, excited concern” (Vaage, 2016, p. 100). Moreover, like with the DIY De-Victimizer KitMark One, Disembodied Cuisine only provoked these mentally incongruous states because the subjects got to know the ingredients over time: Slowly simmered empathy. Not all BioArt pieces can be safely consumed. Imagine eating a piece of Victimless Jacket complete with mushrooming fungi outcroppings. Even if the Victimless Jacket had “behaved in an ideal way…it would have eventually turned into a biohazardous material” (Radomska, 2016, p. 183). Biological waste is always a concern, especially with bioartists like Dr. Hunter O’Reilly, a professor who makes paintings from “deadly viruses” (Cohen, 2002). Even relatively harmless works are subject to legislative control. With Davis’s Microvenus (1986)—wherein E. Coli was transformed with a plasmid encoded with a graphic icon symbolizing protection, the Germanic algiz—the artwork was never allowed to leave the lab, because as the “bacteria are recombinant, biosafety guidelines restrict it to laboratory containment” (Yetisen et al., 2015, p. 730). Thirty years ago, museums weren’t equipped with biologically contained mini-laboratories, so bacterial collages like Microvenus were swiftly exterminated after conception, only physically seen by the artist’s close colleagues. Other law-based intrusions attract more sensationalist coverage, some of which have since caused US artists to feel “their very livelihood threatened by government surveillance and sanctions” (Munster, 2005). Enter the curious case of Steve Kurtz. Steve Kurtz, an art professor at New York State University and founder of the Critical Art Ensemble (CAE), called 911 (American emergency number) when his wife died in 2004. However, upon the discovery of his bacterial cell cultures (i.e. his CAE projects), the FBI arrived and “seized his wife’s body, his house, car, equipment…art projects and other items, even his cat,” to investigate “bio-terrorist weapons production” under the 9/11-spurred US Patriot Act (Munster, 2005). In the ensuing aftermath, the bacteria were deemed benign; however, the colonized art was still confiscated and autoclaved for caution. Another highly controversial art experiment by Heath Bunting has undertones of anarchist-toned activism. Superweed 1.0: Natural Reality (1996) set up an agricultural plot to develop fertile seeds naturally resistant to the Roundup herbicide produced by the Monsanto Company, an American agronomic giant. Bunting’s end goal was the development of a superweed “capable of spreading through a crop that had been genetically modified by companies such as Monsanto to resist a weed killer” (Munster, 2005). Obviously, if such a corporate attack was successful, then a series of lawsuits would likely have terminated the art project. Anclien, J. J. (2009). Crush Videos and the Case for Criminalizing Criminal Depictions. University of Memphis Law Review, 40, 1–54. Anker, S. (2014). The Beginnings and the Ends of BioArt. Artlink, 34(3), 16. Steiner, W. (2010). The Real Real Thing: The Model in the Mirror of Art. University of Chicago Press. Turner’s Masterpieces: Can His Works Be Saved. (1930). The Daily News, p. 4. Perth, WA. Vita-More, N. (2007). Brave BioArt 2: shedding the bio, amassing the nano, and cultivating posthuman life. Technoetic Arts: A Journal of Speculative Research, 5(3), 171–186.